Road 200 in O'Neals, CA offers many colorful monuments to the areas long standing cattle and ranching history. 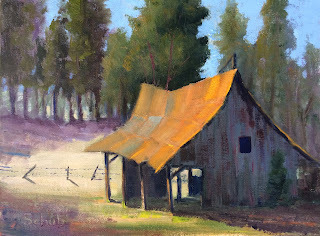 The warm California sun accents the rich color of the rusting roof and the aging rough sawn lumber on the old Allen barn. 9x12 oil on canvas panel.